With gas prices down you may have been thinking of purchasing a new or quality used RV; it’s a great time of year to get out on the open road and see America. One barrier to your purchase may be getting the financing you need. That’s where Pedata RV Center can help. Our inventory of hundreds of RVs are handpicked from the best around the country, and each of them can be financed through us. Let’s explore how you can benefit from buying your RV online with financing from Pedata. Not all online RV sales are alike — Pedata has spent over two decades serving RV customers with the quality recreational vehicles they want. Whether you like staying close to home and traveling to local recreational areas, lakes and parks or traversing the country wherever the road takes you, we have the RV with the features you want. 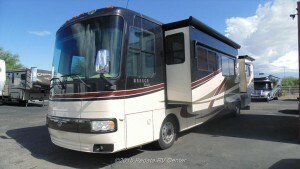 All you need to do is take a look at our RV inventory and select the RV you are interested in. If you are interested in pursuing the purchase, then apply for financing through us. We even offer virtual tours of our RVs so you can see exactly what they look like and get a good idea about all of their unique features. If you would like to come out to our showroom in Tucson, we offer up to $500 off your travel expenses. Our motto is ‘Don’t make a $10,000 mistake’, which means you could pay that much more if you buy your RV locally. Let Pedata, the online RV sales experts, lead you to the best RV for your needs, financed through us and ready to be delivered to your door! Please see our FAQ page for an explanation of this service. As you can see, Pedata RV Center provides you with end-to-end service; from an extensive new and used RV inventory, to the financing you need to purchase the vehicle you want. Ready for an exceptional online RV sales experience? Call us at 888-545-8314 or contact us on our website. Remember: We know about the best RV deals across the country, and we bring those vehicles here to our dealership, which saves you a lot of time reviewing RVs and wondering about their features and quality. Our RVs are handpicked from manufacturers, dealers, and private party sellers from across the nation and all guaranteed by Carfax. Contact us today to buy your RV online!